Sooner or later everybody gets wrinkles in life. The areas most affected by wrinkles are face, neck and hands. Our Skin is composed of various kind of Tissues. 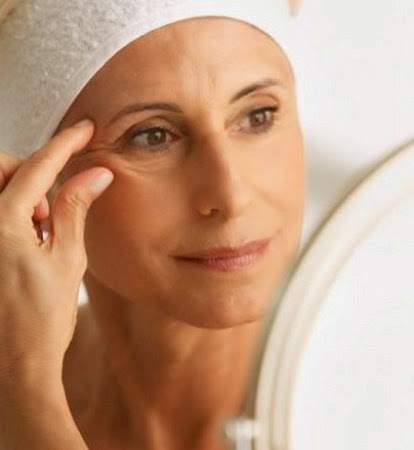 Wrinkles usually appear when the collagen and elastin present in the connective tissue of the skin weaken or decrease in number and loose their elasticity. The loss of skin elasticity and lack of moisture often lead to formation of wrinkles. While age is the predominant cause of wrinkles, let's have a look on some other causes behind formation of wrinkles. To get rid of skin wrinkles, soak 4-5 almonds overnight in water. In the morning peel them off and make a paste of them and add add some honey to make a thick paste. Apply it on wrinkles skin or on full face and scrub off when dries. It is highly beneficial in adding life to your skin plus it feeds the skin with its vitamins and helps a lot to reduce skin wrinkles. Egg white is also considered very effective in getting rid of skin wrinkles and saggy skin. Apply beaten egg whites on the wrinkled skin. Let it dry and then wash off. Alternatively, take 1 egg white, 1 tablespoon of lemon juice and half teaspoon of honey. Mix them well to get a smooth and frothy mixture and apply this mixture on wrinkle forming skin. Leave for about 20-30 minutes and then wash off. Egg white will help to get a tight and firm skin, lemon juice will help to reduce age spots while honey will deeply moisturize your skin. All of these ingredients are very helpful in getting rid of wrinkles. Olive oil massage is also very helpful in reducing the appearance of skin wrinkles. It is a good source of antioxidants, like vitamins A and E, which fight skin-damaging free radicals and prevents the formation of wrinkles. Regular massage with olive oil will not only deeply moisturize the skin but will also repair the damaged cells and help in regeneration of new skin cells. Application of coconut oil is also very beneficial in reducing the appearance of skin wrinkles. For best results, apply coconut oil before going to bed and rinse off next morning. Rubbing the core of a pineapple on the wrinkled area also considered very effective to cure skin wrinkles. Leave it on for 15-20 minutes, then wash it off with lukewarm water. Alternatively, a fine paste of Pineapple can be applied on the wrinkle affected areas and leave it for 15-20 minutes then rinse off with lukewarm water. To reduce the appearance of skin wrinkles, take a little turmeric powder and add sugarcane juice to it. Mix them well to form a paste and apply it on the wrinkle affected skin. Wait for few minutes until it dries. Finally rinse it off, pat dry your skin and don't forget to apply a good moisturizer to prevent skin dryness. For best results repeat this process only 1-2 times per week. Make powder of some dries orange peels and now mix 1 tablespoon of dried orange peel powder with 1 tablespoon of milk cream and apply on your wrinkled skin. This will not only decrease the wrinkles but also helps a lot to give you a fair glowing complexion. Take 1 tablespoon of sandalwood powder and mix with sufficient amount of rose water to make a thick paste . Apply this paste on wrinkle affected areas and then wash off when it dries off. This simple home remedy helps a lot in reducing the fine lines and tones up the skin. Papaya is a good fruit even if applied on the skin. It is extremely useful in tightening the skin and helps a lot in reducing skin wrinkles. Take 1-2 pieces of fresh papaya pulp and mash them well to make a smooth paste and apply this paste on the skin. Apply it directly on wrinkle affected areas of your skin. Leave it on for 20 minutes then rinse off with lukewarm water. Green apples naturally contain several anti aging properties and help a lot in reducing the appearance of wrinkles. Applying the juice of green apples on face daily for 15-20 minutes is really good to prevent and reduce wrinkle formation. Strawberries contain a good amount of anti-oxidants which are very helpful to fight against skin damaging free radicals and prevent the formation of wrinkles. A mixture of strawberries along with honey is very beneficial in getting rid of skin wrinkles. Take 3-4 strawberries and mash them. Add 1 tablespoon of honey to it. Mix them well and apply this mixture on your wrinkle affected areas. Leave it on for 15 minutes and then wash off with cold water. Take 1/4 teaspoon of honey, 1/2 teaspoon of glycerine and 1 teaspoon of olive oil. Mix them well and massage the mixture into your wrinkles skin twice daily. This will eliminate dead cells, reduce wrinkles and help tighten sagged skin. Aloe vera gel helps in wrinkle reduction by improving skin elasticity. A mixture of aloe vera gel and vitamin E oil is highly beneficial in reducing the appearance as well as preventing the formation of wrinkles. Take about 1 teaspoon of aloe vera gel and mix with the contents of 1-2 vitamin E capsules. Apply this mixture directly on wrinkle forming areas and wash off with lukewarm water after half an hour. Mash 1 ripe banana and mix with 1 tablespoon of avocado pulp and 1 teaspoon of honey. Apply this mixture generously on wrinkle affected areas and leave for about 20 minutes. Finally wash off with lukewarm water. A mixture of lemon juice and amla (gooseberry) powder is also very effective in reducing the appearance of wrinkles. Take 1 tablespoon of lemon juice and mix with 1 teaspoon of amla (gooseberry) powder. Now apply this mixture on your wrinkles and wash off after half an hour. For best results, repeat this on a daily basis. Take a fresh cucumber and cut it into thin slices. Dip these slices into fresh lemon juice and then place them on wrinkled skin. Cucumber along with lemon juice will soften the skin and remove wrinkles. Alternatively, take 1 tablespoon of fresh cucumber pulp and mix with equal amount of lemon juice. Apply this mixture on wrinkle forming areas for about 20 minutes and then wash off. For best results you should repeat this process on a daily basis. A simple mixture of honey and lemon juice is also very effective in reducing the appearance of wrinkles. Take 1 tablespoon of lemon juice and mix with 1 teaspoon of honey. Apply this mixture on your wrinkles and wash off after 20 minutes. Take 1 tablespoon of honey, 1 teaspoon of vitamin E oil or full contents of 3-4 vitamin E capsules, half tablespoon of lemon juice and 1 teaspoon of milk powder. Mix all the ingredients and apply this paste on your wrinkle affected areas and leave for 15-20 minutes. Finally wash off using normal water. This simple home remedy not only decreases the wrinkles from the skin but also helps a lot in reducing dark spots. Take about 2 tablespoons of yogurt, full contents of 3-4 Vitamin E capsules, 1/2 teaspoon lemon and 1/2 teaspoon honey. Mix all the ingredients and apply this paste on wrinkle affected areas using a cotton ball. Leave it on for about minutes and wash it with lukewarm water. Note: According to the size of wrinkle forming skin areas, you can increase the quantities of all ingredients used in all above remedies. (i)To keep the skin young and well hydrated and try to drink lots of water. You should drink at least 8-10 glasses of water on a daily basis. (ii)Cut off your daily intake of tea and coffee as they do no good to the skin and make it older than actual time. (iii)Quit smoking because smokers are tend to get a skin which is 10 years older than their actual age. A big amount of free radicals made by cigarette smoke is one of the largest culprits for development of premature wrinkles. (iv)Try to include lots of fresh fruits and vegetables in your diet. Consume dairy products and take vitamin supplements if your body lacks them. (v) Environmental factors such as exposure to dust, air pollutants, harsh lights and chemicals can cause premature wrinkles on the skin. So prevent your skin from Environmental Pollution. (vi)Over exposure to direct sun light may damage your skin Tissues. The damage done by the Ultraviolet rays of the sun is called photo aging. So prevent your skin from direct over exposure to Sun light. Apply a good sunscreen containing SPF15, at least half an hour before going out in sunlight. (vii) Try to adopt a healthy lifestyle in which you eat healthy and balanced diet, do regular exercise and take proper sleep of at least 8 hours. Before going to bed, don't forget to apply a good moisturizer specially on your face, neck and hands.